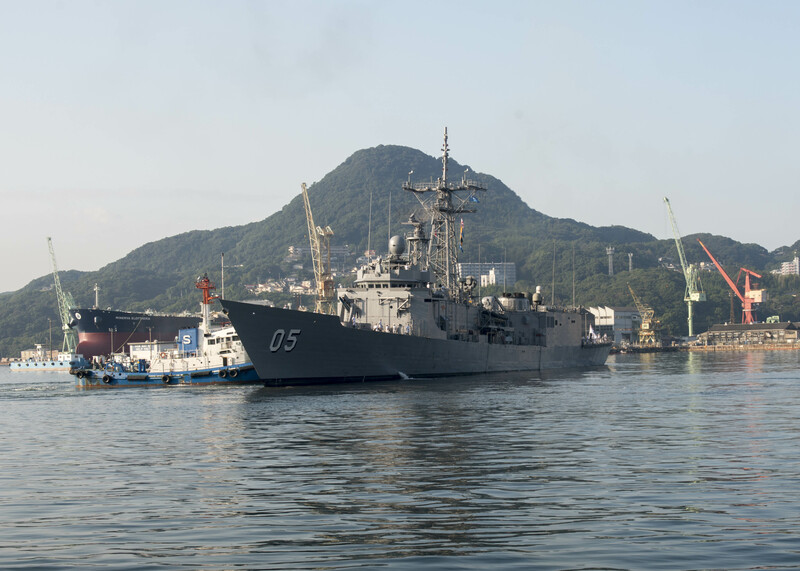 Royal Australian Navy Adelaide-class guided-missile frigate HMAS Melbourne (FFG 05) arrives at Fleet Activities Sasebo for a routine port visit on Oct. 9, 2017. US Navy photo. Japan and Australia are close to inking their first visiting forces agreement, which would pave the way to smoother combined military operations, according to media accounts. When Australian Prime Minister Malcolm Turnbull visits Japan in January, he’s expected to announce an agreement with Japanese Prime Minister Shinzo Abe, according to the Sydney Morning Herald. The two countries have been in talks about the VFA since 2014, the article adds. A visiting forces agreement would clearly define the legal status of foreign forces taking part in temporary military activities such as relief missions or joint exercises, exempt customs on military equipment and other gear needed for military operations, and grant permission for arms and ammunition transport during military visits. While Australia has visiting forces agreements with a handful of nations, including the U.S., this agreement would be a first for Japan. U.S. forces, based in Japan since the end of World War II, operate under a different legal arrangement called a status of forces agreement. Japan and Great Britain are also pursuing a similar agreement, the Sydney Morning Herald article adds. The two nations started discussing a visiting forces agreement about three years ago, at a time when Japan started pushing the boundaries of its self-defense-only military and looking for ways to increase its participation in military exercises in the region. The bilateral agreement between Australia and Japan is just the latest example of the two nations and others in the Pacific, including the U.S., cooperating to counteract the increasingly hostile rhetoric from North Korea and aggressive flexing of military muscle by China and Russia. For instance, a year ago both Japan and Australia announced plans to boost their amphibious capabilities and beef up coastal defenses. With U.S. amphibious forces unable to meet combatant commander demand in the Pacific, the Middle East and other regions of the world, there’s been a growing recognition in Japan and Australia about the need to bolster their military capabilities. More recently, after North Korea fired a missile over Japan, Turnbull called Abe to offer his support and desire to maintain close cooperation, according to media reports. For some time, Australia and Japan have both been equipping their forces with high-end U.S. technology, enhancing their own security but also paving the way for interoperability between the three countries’ militaries. Both Japan and Australia have Aegis-equipped destroyers. A week ago, Abe’s cabinet approved the purchase of two Aegis Ashore missile defense systems, and Australia became the first international partner to acquire Raytheon’s Cooperative Engagement Capability system – a key enabler of the U.S. Navy’s Naval Integrated Fire Control-Counter Air (NIFC-CA) construct. In another effort geared towards increasing interoperability, Japan is considering refitting its Japan Maritime Self Defense Force’s helicopter carrier JS Izumo (DDH-183) to accommodate U.S. Marine Corps F-35B Joint Strike Fighter operations. Japan will field an F-35A conventional take-off and landing fleet, but the Marines’ F-35B short take-off and vertical landing variant will begin operations out of Japan in 2018.